Jacky Chew, a singer-songwriter born in Singapore. 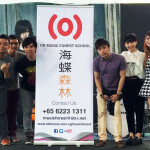 Jacky was from the same batch of the V-Singer program with JJ Lin, a program set to train singers to be professionals organized by Ocean Butterflies Music. Jacky participated in Channel U singing competition “SuperBand” with 2 other members which they called “J3” in 2006, and made it to the TOP 4 finalist. 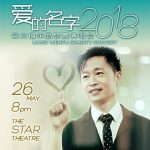 He released his first album 《Jacky周玮贤同名专辑》in June 2015.